In September, 2000, your friendly Texas Skunk visited Egypt, Jordan and Israel. They haven’t been the same since. I was using a Sony digital Point & Shoot camera with probably a 3 megapixel resolution. Thought it was a great camera at the time. The tour was assembled for us by a Professor of Egyptology at USC in Los Angeles. Landed in Cairo and spent the night in the El Salam Hotel. Thing I remember most about it was that they had great Pizza or maybe I was just really hungry. Next morning we flew to Luxor and boarded the MS Beau Soleil for a cruise up the Nile. Ms. Skunk was along to try and keep me out of trouble. Good luck with that! Click here for an excellent web site concerning ancient Egypt. A quick visit may make the following more meaningful – or not. Our first stop was at the Temples of Karwak and Luxor. The Egyptians had many Gods and Goddesses. Here are the major ones. You will see them many times in wall decoration and hieroglyphics. In addition you will also see many Kings and Queens depicted. Notice that the male gods mostly have animal heads while the female ones are depicted naturally. Kings and queens are also usually depicted naturally, but not always. Good luck figuring out who is who and what is what! Many of the wall decorations we saw were carved directly into the stone. Are we in Washington DC? No, Egypt is where the original obelisks were hewn from a single piece of stone. 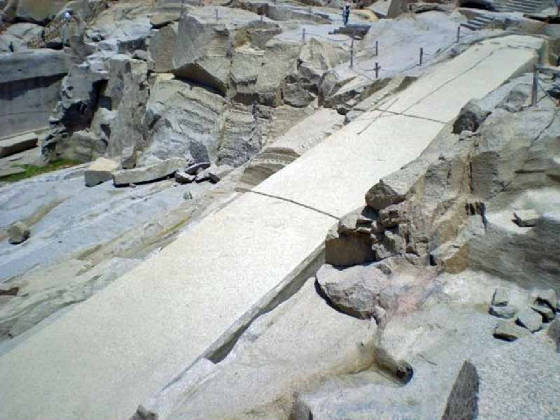 It is believed that these giant pieces of stone were hewn in a query and then floated down the Nile to the intended destinations. They were then dragged onto a pile of sand using rollers made from tree trunks. The sand was subsequently dug away causing the base of the obelisk to tilt down and the tip up until it was in a vertical position. Many obelisks were looted from Egypt and moved to other parts of the world including he one in St. Peters Square at the Vatican. In total, there are 13 looted obelisks in Rome, more than any other country. probably due to the Roman occupation of Egypt from 30BC to 650AD when they were expelled by the Muslims. The later part of the Roman occupation was also greatly influenced by the Greeks. Obelisks were commonly raised in pairs at the entrance temples. The colors are believed to be original although obviously faded over the years. Some were still quite bright. especially in locations protected from light. The ship had an Egyptian themed party. Skunk & harem? From here we went to the Valley of the Kings. Click below to go with us.